Heat the grill and cook the bacon on each side until very crisp. Chop into small chunks and combine with the bread crumbs and ¼ of the cheese then set aside. Boil the kettle to fill a large pan. When boiling vigorously in the pan add a pinch of salt and the macaroni. Cook for 9 minutes then add the asparagus and cook for a further 2 minutes. While the macaroni is cooking, melt the butter in a small thick-based saucepan, sprinkle in the flour and stir with a wooden spoon. Cook whilst stirring for a minute then add the milk a little at a time, stirring continuously so it is absorbed into the flour and slowly makes a smooth sauce. If you get any lumps, don’t panic, just beat vigorously with the wooden spoon and they’ll disperse. Stir in the mustard, some black pepper and the remaining cheese. 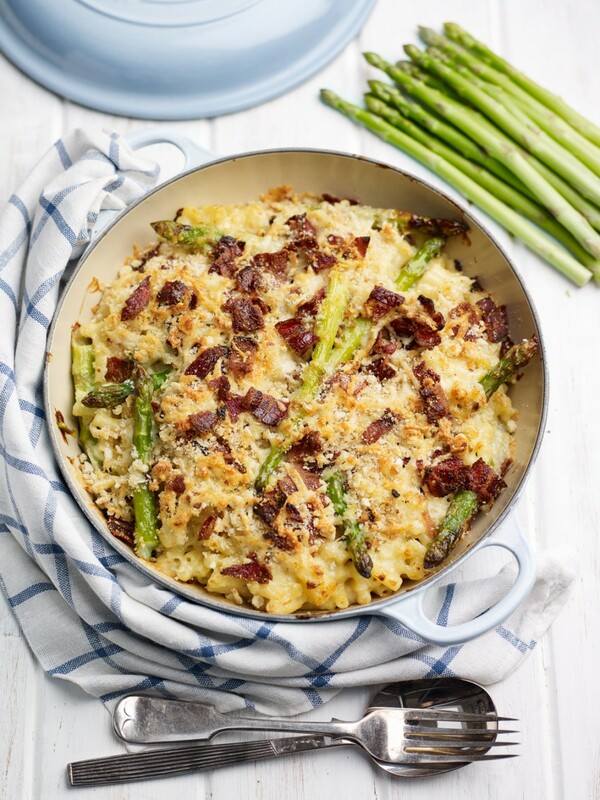 Once the macaroni and asparagus are cooked, drain well and return them to the pan. Pour over the cheese sauce and stir to coat well. Tip the macaroni into a large oven dish, sprinkle over the breadcrumb mixture and return to the grill for the top to melt and brown.